Building insulation material is divided into two categories according to the base material: organic insulation composite materials and inorganic high barrier materials. organic thermal insulation materials are generally made by extruding polyethylene on aluminum foil surface, relying on hot melt adhesive to make XPE/EPE foam and poly weave multilayer material. The product has excellent heat preservation and heat insulation function. 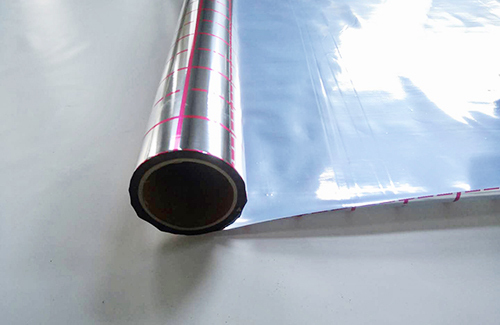 The aluminum foil is with high reflectivity, XPE/EPE cross-link foam, its discontinuous air layer, slow down the heat conduction and break heat convection, so the solar radiation absorption coefficient is only 0.07, can reflect more than 93% of radiant heat, the heat insulation will not be affected by moisture, so is widely used in building surface and outer wall heat insulation. The inorganic high barrier material is made by aluminum foil and glass fiber with polyethylene hot lamination, in the meantime to improve its corrosion resistance with special anticorrosive coating processing. Its smooth surface, high reflectivity, high tensile strength, wind and waterproof and high barrier function can satisfy the application for HVAC duct, cold and hot pipe heat insulating and vapor barrier. Also suitable for building insulation to make the indoor warm in winter and cool in summer, the four seasons is comfortable. Copyright © 2015 Zhejiang Pengyuan New Material Co., ltd.　浙ICP备08102596. Sitemap　Powered by Lidgen Media.